“Floating” refers to a form of sensory deprivation therapy where the individual remains in a state withdrawn from their senses for a prolonged period of time. 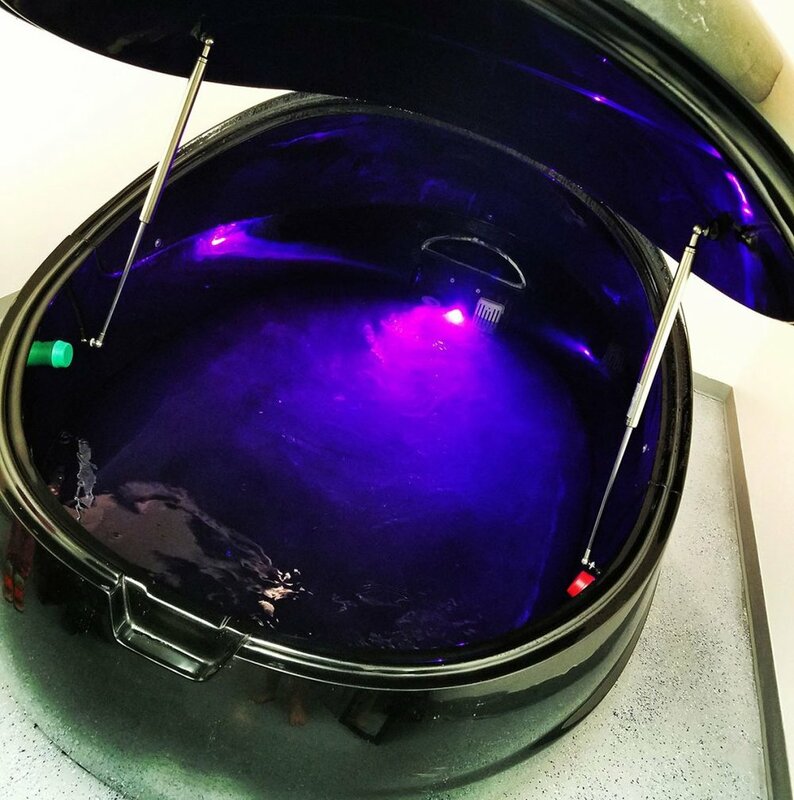 Our float pod provides an environment free from light and sound where the user floats suspended in dense, magnesium-saturated water. This creates a zero gravity effect, allowing the body to feel weightless with no risk of drowning. Inside the closed float pod the body is free of sight, sound, and touch. This allows the mind to become clear and brings the body into a heightened state of relaxation. During a session, the heart rate lowers, blood pressure normalizes, the breathing rate is restored, and digestive functions are regulated. Floating is beneficial for relieving physical pain because the body becomes highly oxygenated, promoting better blood flow throughout the body and reducing muscle tension. Additionally, this process enhances athletic performance by reducing lactic acid in the blood, reducing stiffness and pain, and improving focus. When starting your float session, you will begin by washing your hair and body with soap and shampoo only to ensure that no skin or hair products are present. You will then insert your earplugs, tie back long hair, and grab a head support (if choosing to use one) before stepping into the tank. Once inside the float pod, lower the lid to be completely closed or at the level you are comfortable with. Keep in mind that without completely closing the lid, some outside light and sound may be present, and that the lid can be easily opened at any time during the session. Even when closed, the float pod will remain well ventilated. If you have chosen to have calming music or sound while you float, it will begin to play. During your float, do your best to focus on your breathing and enjoy the benefits of float therapy. At the end of the session, exit the tank and rinse off the salt water before redressing. This top of the line float pod was designed with high quality materials to ensure the best float experience possible. The Dreampod is crafted with maximum sound proofing and heat retention as well as a specially crafted door that supports the sensory deprivation experience while still allowing easy access in and out of the pod. Additionally, the built-in sound system and selection of calming music and sounds gives new users the opportunity to heighten their relaxation while easing into a sensory deprived state. Book your float session today! Call (951) 394-2653!